The receding shoreline of the Salton Sea is exposing some very interesting and long submerged geothermal features. One of these newly exposed features off of Garst Road, north of Red Hill, between the Alamo River and Mullet Island is the spectacularly active mudpots. Mudpots, mud volcanoes, mud domes, paint pots and several other names are given to these features. Double checked my BS meter here so with some research and a reasonable amount of assuredness…all of those descriptions are just fine! 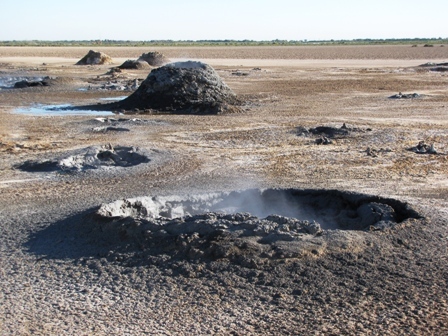 The more scientific term, I am using that term loosely here, is that the mudpots are fumaroles and the raised “volcanoes” are called “gryphons”. To quote from the book THE SALTON SEA by Karl Anderson, ”They are formations created by geo-excreted liquids and gasses.” And spectacularly excreted they are! The fumaroles are driven mostly by CO2 gas which is Carbon Dioxide. The same CO2 that goes into soda pop. 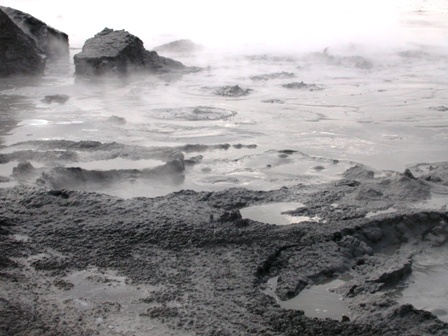 It pushes up through the earth and hot geothermal brine but when it reaches the surface it is NOT boiling hot water. CO2 makes the bubbles, not heat. The pots, even some whithin a few feet of each other, can have sharply different temperatures. Some hot enough to scald you but most are just warm. There are other gasses being emitted as well so getting down and breathing straight out of one ot the tubes would probably be a bad idea. They have been here for a VERY long time and this is not ”new evidence” that a new volcano is going to blow up the west coast! The two videos above were taken on Oct 29, 2012 while exploring the valley with Jennifer and Crissy. More videos are available on my YouTube channel by clicking on THIS LINK. Below is a Google Map with directions….. BUT FIRST a few words about going there. You can walk out to them but it is about 2.25 miles one way. If you drive out you MUST have a high clearance vehicle at the very least. I have seen a Honda Accord out there a few times but he obviously understands off road driving better than most and has maybe a little less respect for his vehicle than most! All of that said, if you stick to the proven path of those who have successfully made it out before you AND it has not rained there for at least a week or more, you will do just fine so get out and explore our spectacular backyard! If you click on the link to view it in a larger map, you will see a legend for the markings on the map. There are also gryphons and mudpots, represented by the blue markers, near the intersection of Davis and Schrimpf Road that are easily accessible but not as spectacular as those near Mullet Island. The area north of the end of Garst Road where is crosses the Alamo River, I have always known as Morton Bay but I am not sure where the name comes from. One version I heard was because Morton Salt mined salt there. So I did a double check on my BS meter again and did some more research. There are some VERY intersting stories from that area that I will get into in later posts. Salt was mined in that area but I found no connections to Morton Salt. Maybe it was just called Morton Bay in recent times because that is the name most people think of when they think salt! The company that did mine there was “Mullet Island Salt Works Mine (Mullet Island Development Company; Mullet Island Paint Company; Reeder Salt Company), was located 5.2 miles west of Niland”. The coordinates given on mining maps place it just on the north side on Mullet Island and that mine operated from 1940 to 1942. There were other mines, some more successfull and some not, farther north that started earlier and or ran longer and that is yet another fascinating story! See ya at the sea…………………..